BrightSea’s railway station is a busy place. A porter pushes a trolley laden with mail sack and packages, a business man buys a snack from the vending machine and a skateboarder checks his texts. What else will you find as you stitch? As always I had a great time designing and stitching this. 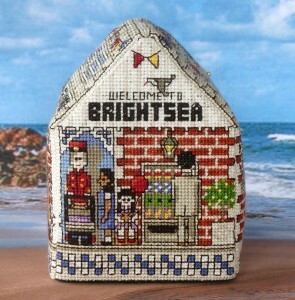 Because I’ve designed a few more BrightSea Village Patterns before I stitch each one I’ve usually forgotten most of the details so I get to enjoy the thrill of discovering all those little things as I stitch. This entry was posted in Uncategorized on December 30, 2013 by Elli Jenks.